﻿When it comes to beer, I know pretty much nothing. I only know that much like wine and coffee, beer comes in many types, some with lighter bodies, some heavier, some taste bolder, while others are very mild. 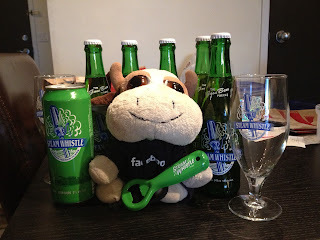 So I had to do some research to find out more about beer, Steam Whistle in particular. 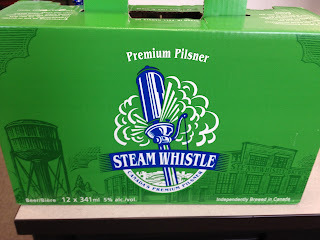 Steam Whistle is a Canadian beer, made in Ontario by three friends who had worked together at a microbrewery until it was bought out and they found themselves unemployed. Undeterred, they decided instead to take their collective knowledge and develop their own beer. Their focus is brewing a single, premier Pilsner with traditional techniques and natural ingredients. Turns out Pilsner is a style of lager that was created in the Czech Republic, back in the 1800’s when the majority of beers were darker in color because they were top fermented, and therefore cloudy. In Pilsen, they decided to open a city owned brewery, and utilized bottom fermenting yeast which made the beer more clear. So modern Pilsners tend to look clear, are yellow in color, and taste and smell of hops. 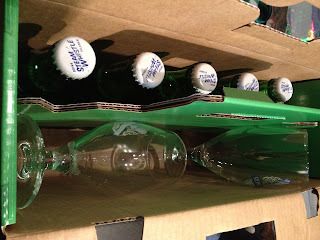 This particular case of Steam Whistle was delivered to me in a large, heavy duty cardboard, re-sealable box with a handle for carrying. In eye popping apple green, it was hard to miss the retro ‘50’s design. Inside I found a can and several nostalgic looking bottles of Steam Whistle, complete with two beer glasses and an old fashioned bottle opener. Although I wasn’t familiar with the reason for the etching at the bottom of the glass, my man human was. Turns out they were widget glasses, a beer glass with a laser etched pattern on the bottom to help with the release of the carbon dioxide bubbles, which helps to maintain the head on a beer. The head on the beer is the foamy part on top, created by the release of carbon dioxide. After allowing them to chill, I cracked one open to finally try. Considering the fact that I normally don’t like beer, this one was actually very easy to drink. It had a definitive hop taste to it, with just a hint of bitterness in the aftertaste. 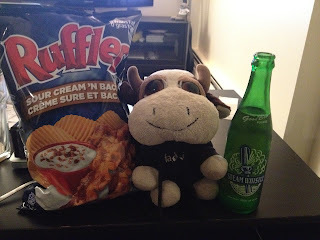 I found the body to be very light and smooth, and a perfect pairing for my favorite salty snack, sour cream 'n bacon chips. It’s a good introductory beer for those who don’t like big, bold, overly bitter tasting beers, or are just starting to delve into the world of beer. Overall, I’d recommend Steam Whistle for those that aren’t big beer drinkers, as it’s a very easy beer to drink. 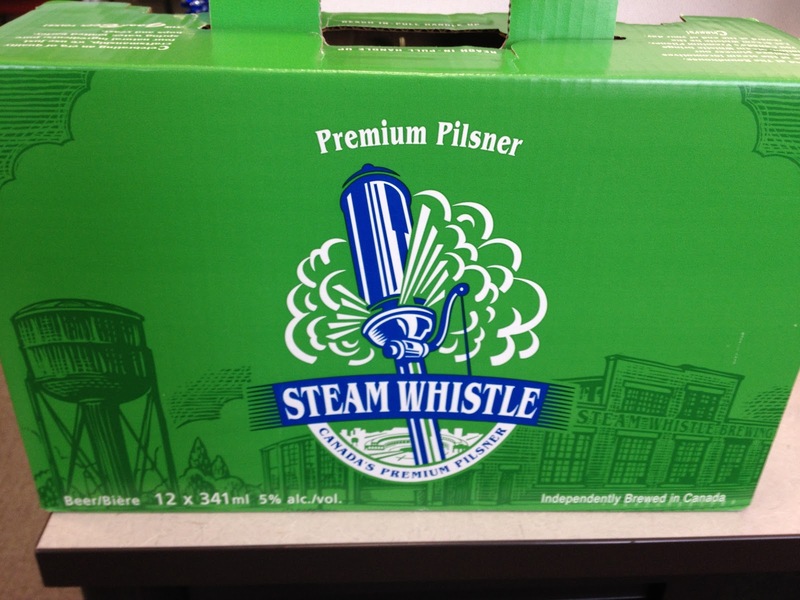 If you’re looking for Steam Whistle, from what I’ve seen it’s fairly commonly sold in liquor stores and restaurants around Edmonton. This beverage looks really good for a poker night. I'm not much of a ruffles fan but bacon and sour cream flavor just really gets me.